Fellows will participate in a UCal pilot program that helps early-career scientists look at their technologies from a commercial perspective. Four postdoctoral researchers at Los Alamos National Laboratory have been named Entrepreneurial Fellows as part of a new joint initiative of the University of California and Los Alamos. 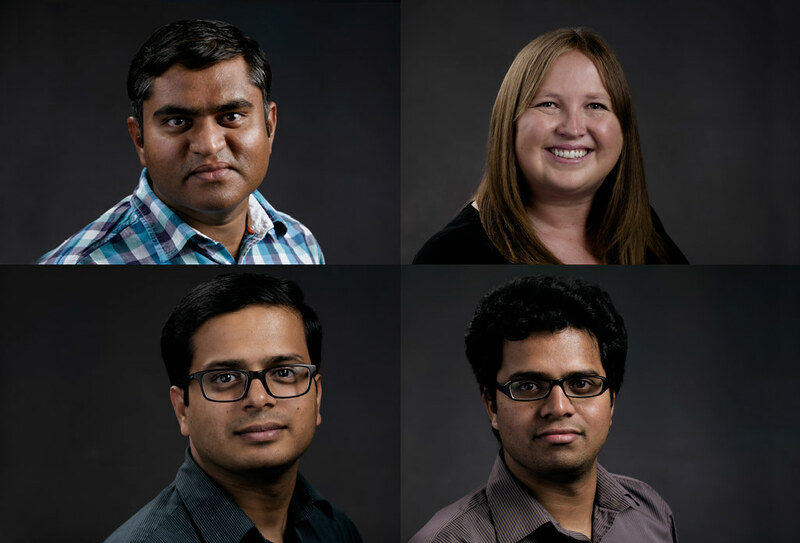 Clockwise from top left: Anand Kumar, Jessica Kubicek-Sutherland, Vamshi Chillara, and Maruti Mudunuru. Photo credit: Los Alamos National Laboratory. LOS ALAMOS, N.M., October 5, 2017—Four postdoctoral researchers at Los Alamos National Laboratory have been named Entrepreneurial Fellows as part of a new joint initiative of the University of California and Los Alamos. The researchers will participate in a six-month pilot program designed to help early-career scientists think about their technologies from a commercial perspective and bring them to the marketplace faster. Vamshi Chillara from the Laboratory’s Materials Physics and Applications division, who is developing a technology that would power implants using ultrasound, thus providing wireless energy delivery for biomedical applications. Jessica Kubicek-Sutherland from the Laboratory’s Chemistry division, who is developing a universal bacterial biosensor that will allow for the rapid differentiation of bacterial pathogens in a patient’s bloodstream to quickly determine the appropriate treatment. Anand Kumar from the Laboratory’s Bioscience division, who is developing a universal gut microbial cocktail to treat Clostridioides difficile (C-diff), a severe intestinal infection in humans. Maruti Mudunuru from the Laboratory’s Earth and Environmental Sciences division, who is developing a low-cost, energy-efficient, and near real-time monitoring of Earth and environmental processes. The Fellowships will end in April 2018 with final presentations and a closing ceremony. Solicitations for the second year of the Fellowship program will go out to the Los Alamos postdoctoral community in November 2017.